At The Plumber's Plumber, our team is made up of specialized experts who service Florida residents with all of their sewer pipe needs. Sewer systems are used every day to allow waste to be flushed away from your property which is why they need to be taken care of all year long. Sewer overflow also known as sanitary sewer overflow is a condition where untreated sewage is released from the sewer into the environment before it has the chance to reach a sewer treatment facility. Our team at The Plumber's Plumber is capable of servicing your sewer pipes to make sure that they are running properly to prevent sewer overflow as well as solve an emergency sewer overflow issue right away. We understand that sewer and drain issues are often out of residents control because they cannot predict when they are going to happen, and there are many reasons that sewer overflow can occur. Causes of sewer overflow include clogged and blocked sewer lines, infiltration of excessive water flow during heavy rainfall, malfunction of your pumping system, and broken sewer lines. No matter what causes sewer overflow, it is important to seek professional help when preventing and solving sewer and drain pipe problems. Our team at The Plumber's Plumber understands that sewer overflow can be a stressful thing to think about, however, we can provide our expert services to prevent sewer overflow from occurring. Our industry professionals can assist you with preventing sewer overflow with sewer camera inspections and drain cleaning. Sewer camera inspections are the most important service we offer at The Plumber's Plumber because they allow our team to get an intimate look at your pipe's interior without any excavation. Sewer camera inspections can be performed on the interior of exterior of your property. 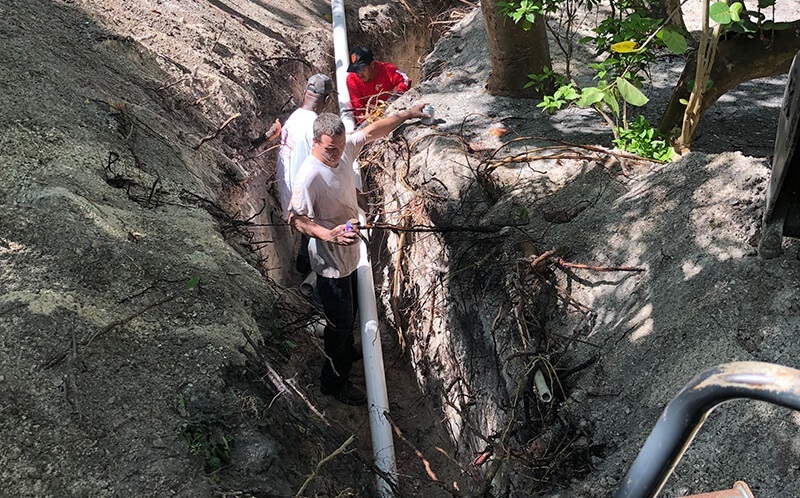 The process begins with our team establishing a clean out hole on your property and inserting a flexible rod with a high-definition camera attached to it into your pipeline. As the camera weaves its way through your pipe, it provides a live-feed of your pipeline in addition to revealing all imperfections within your pipe system that could cause sewer overflow. When the inspection is complete, our team will have all necessary information to provide you with a service that will protect your pipes from sewer overflow. The drain cleaning services we use at The Plumber's Plumber are always affordable and environmentally-friendly. Our most reliable method of drain cleaning is hydro jetting. Hydro jetting uses high-pressure clean water to clear out your sewer pipes with precision and speed. Our team will use the same access point that was established during your sewer camera inspection which allows the process to be seamless. Hydro jetting can clear out the most difficult clogs and effectively restore the function of your pipe. At The Plumber's Plumber, our team can inspect and clean your sewer pipes throughout the year to ensure that you do not suffer from sewer overflow. Our team of industry professionals at The Plumber's Plumber is always standing-by and ready to assist you with your sewer overflow problems. Sewer overflow is not something to be taken lightly because it can pose serious health risks to the environment and people around your residential, commercial, municipal, or industrial property. At The Plumber's Plumber, we service areas include Fort Myers, Cape Coral, Estero, Lehigh, and Bonita Springs, Florida. If you would like to stay proactive about your sewer system's health, call to speak to one of our friendly technicians today.